Kangra takes pride in being home to the Katoch dynasty as one of the oldest surviving royal dynasties in the world. Spread out over the western region of the state, Kangra is by far the largest region of Himachal Pradesh. In the shadow of the majestic Dhauladhar ranges, the valley is also one of the most diverse and picturesque one. The people are gentle, hardworking and very hospitable. Recorded history of Kangra dates back to more than 3,500 years. The prosperous land was subject to many invasions, but the strategically located strong fort of Kangra held out, foiling plans of most invaders. The fort in 1615 AD did even withstand a siege laid by Mughal armies of emperor Akbar. The fort’s defences in thousands of years of its history was but rarely broken into. The natural beauty of the land gave refuge to arts and artists who fled many royal courts after the Mughal empire declined in the 17th century. A synthesis of local art forms gave rise to the famous Kangra school of painting. Masterpiece miniatures of this unique art style are on display in many reputed galleries around the world. Languages Spoken: People engaged in tourism speak and understand English, Hindi and Punjabi. The natives mostly speak Kangri, a dialect, in their everyday lives. Clothing essentials: The lower regions of Kangra experience high summer temperatures, whereas the hill towns are cooler with a moderate climate. Cotton clothing is suitable for the summer months and light woollens are needed when it snows in the hills parts of the district. Heavy woollens are needed for the winter. Air: Kangra Airport at Gaggal is just 10 km from Kangra. Between Kangra and Delhi there are regular daily flights. Railroad: Kangra is connected by the Pathankot – Jogindernagar narrow gauge rail line. A journey on this track passes through the some very scenic valleys. Road: Kangra is well connected by road to cities like Delhi, Chandigarh and Shimla. Shimla – Kangra distance is 220 km, Delhi – Kangra is 456 km and Chandigarh – Kangra is 223 km. Luxury coaches, public carrier buses and taxis are readily available for all destinations. Because of the diverse demographics and cultural splendour, Kangra has plenty of destinations that will satiate the cravings of any traveller. One of the largest and the oldest forts in the Himalayas, Kangra Fort built by Katoch rulers dates back thousands of years. Earlier it was known as Trigarta, a kingdom that finds mention in the Mahabharata. Later it came to known as Nagarkot Fort. Built on a high ground that is naturally protected by River Banganga and another stream on three sides, the fort remained as one of the strongest ones throughout its history. It was the devastating earthquake of 1905 that caused extensive damage to it. Even in its remnants, many well preserved valuable stone sculptures, carvings, idols and other artefacts placed in the museum at the entrance of the fort speak about the grandeur that the fort once held. Kangra Art Museum in Kotwali Bazar is a treasure collection of delicate art forms, historical artefacts and Tibetan heritage. There are more than 1500 artefacts and crafts on display that date back to the 5th century AD. Other than the miniature paintings, the museum has a fine collection of sculptures and anthropological items on display which provide an insight into the bygone ages. Shree Bajreshwari Mata Temple in the heart of Kangra town honours goddess Bajreshwari , an incarnation of goddess Durga. According to the legend, the temple was originally built by Pandavas during the Mahabharata era. The fame and riches of the temple attracted many invaders over the centuries. Plunder of the temple by Mahmud of Ghazni in circa 1009 AD carrying tons of gold and other valuables over the Kyber Pass is well documented by historians. After every invasion, the temple was rebuilt and restored to its old glory. The temple was flattened by an earthquake in 1905 but has since been rebuilt and restored. An eternal flame of natural gas that has been burning for thousands of years from a hollow rock is revered as the manifestation of goddess Jwala Devi. Every year during Navratra days in March-April and September-October colourful festivals are held at Jwalaji. The natural flame is protected in the sanctum sanctorum with a gold layered dome shaped temple built over it. Not too far from Kangra, this popular place of pilgrimage is 55 km for Dharamshala and 35 km from Kangra. In the shadow of the mighty Dhauladhar ranges, on the banks of River Baner, the Chamunda Devi temple complex has very scenic surroundings. The temple is believed to be more than 400 years old. Local legends has us believe that it was in a dream that Devi Chamunda appeared to a Brahmin. At her command he laid the foundation of this temple. Easy to reach, this highly revered temple is 15 km for Dharamshala and 24 km from Kangra. An architectural gem, the stone temple of Baijnath was rebuilt at an existing temple site by two local merchants in circa 1204 AD. 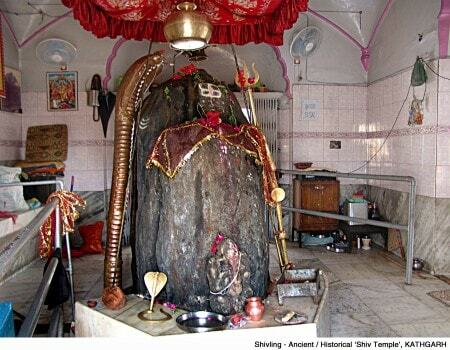 The shikhara style temple houses a divine Linga which is counted as one of the 12 Jyotirlingas in the country. Believers hold that even Ravana, the king of Lanka and a devotee of Lord Shiva, also meditated at Baijnath. For Shivratri the temples is draped in flower garlands which enhances its beauty and grace. The town holds a fair which draws a lot of devotees to the temple. With a large number of domestic and foreign tourists drawn to Kangra each year, there are some good dining, medical and internet connection facilities available in and around the township. Kangra has good private and government run healthcare facilities. The government Civil Hospital, private Fortis Hospital and Tanda government medical college and hospital are well equipped to meet any emergency that a traveller may need in the area. The town is well connected by road to the major cities of Dharamshala, Shimla, Mandi, Kullu, Chandigarh, Delhi, Pathankot and others by private and public transport networks. Luxury coaches, public carrier buses and taxis are readily available for all destinations. All national mobile phone operators have services in Kangra. The town also has good internet connectivity. Best time to visit Kangra is from September to May. This is an ideal time to go sightseeing, indulge in adventure sports and join in other outdoor escapades. Celebrated on 13th January, Lohri brings the community together for an evening spent dancing to folk songs around bonfires in many parts of Himachal. The Pragpur Lohri of Kangra is a time when the township holds a fair for the occasion. Held twice in a year on the auspicious days of Navratras, the entire Jwalamukhi town wears a festive look. A large number of pilgrims visit the temple to seek blessings of goddess Durga. Devotees pay their respects by gifting the goddess red silken flags and offering prasad. In April, Rali is celebrated in Kangra. The festival commemorates a maiden Rali, who leapt into a stream after she was married against her wishes. The groom and her brothers too jumped to save her but none survived. For the festival clay models of all three are made to which maidens pray for grooms of their choice and the newly-wedded pray seeking happiness and prosperity. 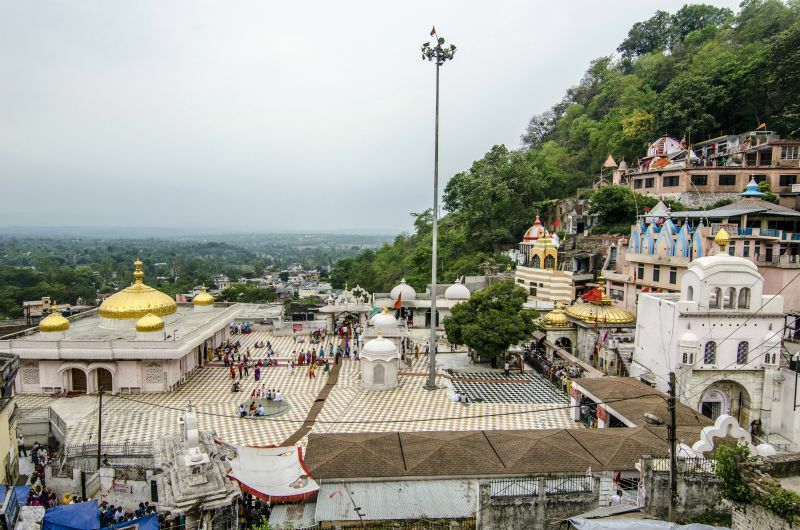 Kangra also hosts other seasonal religious fairs and fests in the form of Shivratri of Baijnath, grand Holi celebrations in Palampur, Baisakhi of Kaleshwar Mahadev, grand Dussehra celebrations of Jaisinghpur and Baisakhi of Jwali. The torrential Banganga River deep in the valley forming a formidable sheer and the Kangra Fort lurking atop the flat mountain range is a scene that one encounters on nearing Kangra town when you drive from Shimla-Mataur national highway. A feeling of awe mixed with joy pervades you as you look back in time. 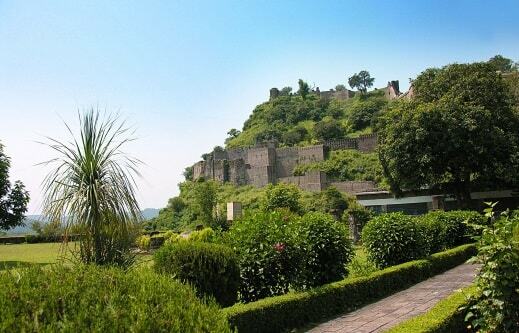 The Kangra Fort is approximately 3 Km from the town and is also known as Nagarkot. The fort is historically significant; its massive size and the beauty of its structure lend it an added charm. At the entrance is a museum containing some valuable old photographs of the fort prior to the devastating earthquake of 1905 and some exquisite stone sculptures, carvings, idols and other artifacts. 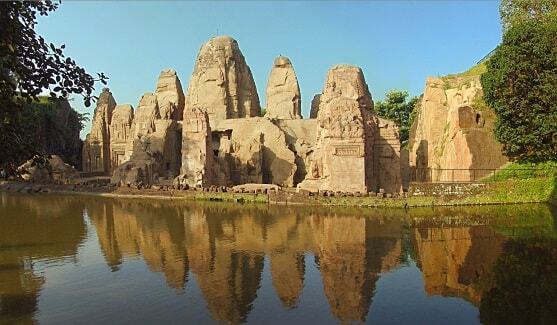 The Masroor Temple of Kangra is a rare monolithic rock cut temples in North India that is dated to circa 8th century AD. It is an ambitious feat comparable with the rock hewn shrines of Ajanta and Ellora in Western India. Dedicated to Lord Shiva, Vishnu, Rama, Lakshmana, Sita and other Hindu deities, the complex in all has 15 Indo-Aryan style temples cut in the rock. They face the eastern Sun with a rectangular pool in the courtyard. Reflection of the temple shikhara’s in the pool waters casts a spell binding image of Masroor. In easy reach, this rare temple complex is only 40 km from Kangra. Maharana Pratap Sagar is one of the largest manmade lakes of the country. It was formed after completion of the Pong Dam on River Beas in 1975. The dams backwaters has developed into a rich wetland with a lot of fish fauna that attracts thousands of migratory birds to it each winter. As a habitat of birds species of many kinds, the reservoir was declared a bird sanctuary in 1983. It is also a Ramsar Wetland site. Avid bird watchers and anglers are regular visitors of Pong Dam backwaters. 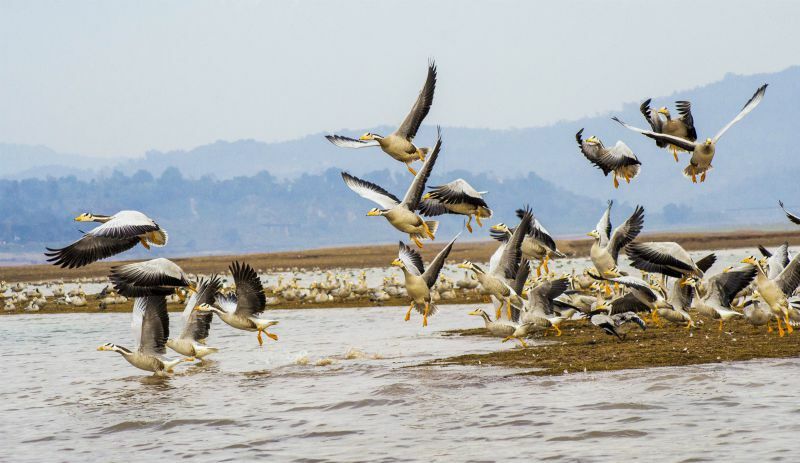 Among the crowded waterfowl population in winters one can easily sight the bar-headed geese, northern lapwing, ruddy shelduck, northern pintail, black-headed gulls and other birds. Pong Dam can also be easily reached from Nurpur, Jwali, Nagrota Suriyan, Talwara and other towns like Dharamshala and Kangra. Located at an elevation of 2000 feet above sea level, heritage village Pragpur is ideally suited to explore the Kangra valley. Many places of historic, religious and cultural importance are within easy reach. With its equitable climate, easy access, safe passage and rich flora and fauna, Pragpur and its surroundings offer an ideal location for rural tourism. The rich heritage of Kangra is best displayed at Pragpur, a village founded in the late 16th century AD. Borrowing architectural traits from the Portuguese, British, Italian and Rajput styles, Pragpur with its cobbled lanes, mud houses and slanting slate rooflines has time stand still. For its unique effort in conservation, Pragpur has been declared as heritage village. The small village is a dreamland with Mughal style gardens, pleasure terraces and large water reservoirs. This popular place of pilgrimage is accessible from Kangra (35km) as well as Dharamshala (53km). The ancient temple is built against a wooded spur, has a dome that was gilded by Maharaja Ranjit Singh. Pilgrims consider an eternally burning flame emanating from a hollow rock in the sanctum to be a manifestation of the goddess Devi. The temple comes alive with Navratra colorful ones and colourful fairs during March-April and September-October every year. Himachal Tourism’s ‘Hotel Jwalaji’ is available at Jwalamukhi. The temple of Kaleshwar Mahadev is 10 km from Pragpur and 18 km from Nadaun on the banks of the river Beas. It is famous for the sacred Panchtirthi waters. Pilgrims take a holy dip on the day of Baisakhi (13 April) in Panchtirthi and the nearby river Beas. Local lore traces the origins of this temple complex to the exile of Pandavas, an episode from the ancient Indian epic, the Mahabharata. 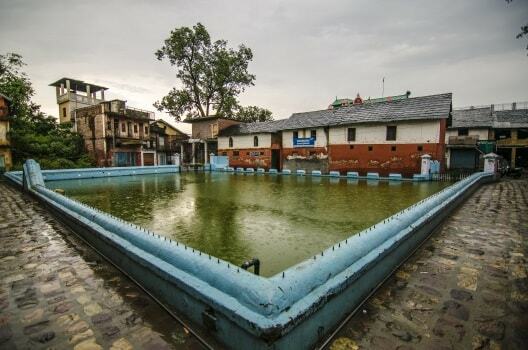 About 30 kms from Kangra, Tatwani is a place well known for its therapeutic hot water springs. Enroute to the water springs is a place called Machhial which has a nice big waterfall. There is a Shiva temple at Kathgarh. It is 90 km from Dharamshala via Nurpur-Indaura. The temple enshrines a human size linga, which is vertically split into two parts. The distance between these two parts keeps increasing and decreasing from time to time. The bigger part is worshipped as Shiva and the smaller part as Parvati. One of the myths about the pillar is that when Lord Vishnu and Brahma were engaged in a battle to settle the issue of hierarchical supremacy, Lord Shiva intervened in the shape of a fire pillar and made the warring gods see reason. It is believed that the pillar of Kathgarh is the same pillar of fire.